Thunder Bolt and Lightning Very Very Frightening Me | take your marks. go. There was a deep rumble that filled the room. I stirred from my sleep and felt the thunder shake through the floor one more time. Disorientated, I pulled my sheets closer around my shoulders and curled into a tight ball. Another low rumble, growled through the sky, my tiny single bed shaking from the noise. A bright flash filled the room, I squinted in the half light, my sleepy eyes not yet ready to be opened as a second flash of lightning filled the room. 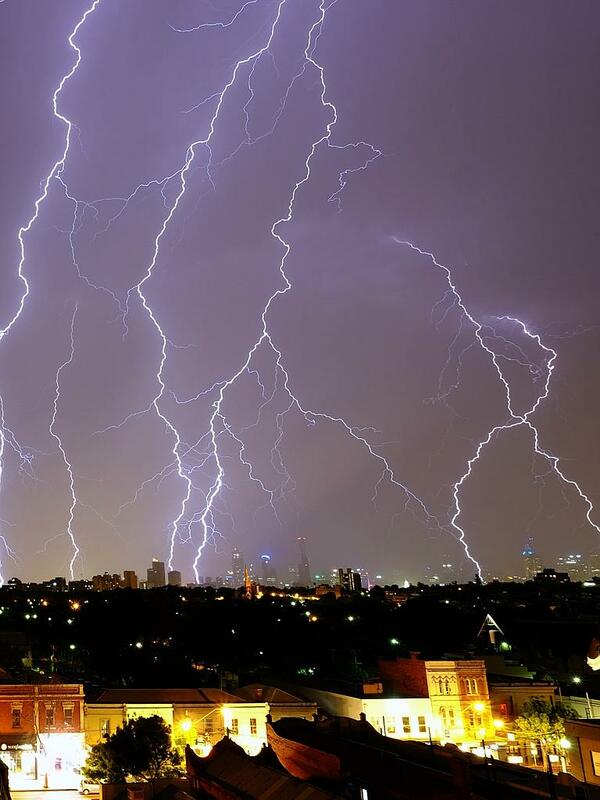 The thunder growled over head almost immediately, bearing down onto our small apartment as the lightning continued to fill the night sky with it’s brilliant white forks. There was no rain yet. The rain was still to come. I curled tighter in bed, willing the storm to pass quickly. I’d never heard thunder like it in my life, it was so loud and so close, it filled the night sky, unforgiving, demanding to be heard. Another flash of lightning and my curiosity got the better of me. I crept to the window and peered out of the curtains. More thunder, shaking the windows and another bolt of lightning lit up the sky before darting down and striking the roof of our complex. I heard a strained cry of panic come from somewhere and looked round into the dark, my eyes slow to adjust, but I was alone. Another deep boom of thunder rolled past and I heard the scream again. I wrapped myself in the curtain to escape the screams and kept my eyes fixed on the night sky. Another bolt of lightning darted across the sky and as the thunder boomed overhead my bedroom door burst open and I heard the same scared, startled noise. I realised it was me. Hearing me scream Louisa had come back upstairs to check on me, timing her entrance perfectly with the rolls of thunder. I’ve never been a huge fan of storms. I have vivd memories of my Grandad sitting with me in front of the bedroom window, watching the storm so I wouldn’t be scared; counting the seconds between the thunder and the lightning, guessing how far away it was. And he’d hold my hand and tell me there was nothing to worry about. We stood at the end of my street, in one of those dry storms you get after weeks of hot summer and watched the lightning, I wanted to wriggle away in fear, I was so scared, but Grandad was holding my hand, so I knew I was safe. Grandad wasn’t here now, there was no one to hold my hand. This was the biggest storm I had seen in my life and I had to do it on my own. The rain started then. Slowly at first, but within seconds it was pounding down on our roof, nearly downing out the sound of the thunder with it’s force, spilling down the road and into the drains, wave after wave of thick hot rain. I turned to Louisa from my hide in the curtains. My phone buzzed and I jumped, I was on edge, I’ve never been a jumpy person, and I don’t often get scared of things so I never know what to do with myself when I am: it was the boys. Everyone was awake now and without to much persuasion, I would rather be in a room full of people than on my own, I ran into the boys room and wedged myself next to the window, between the wall and their wardrobe, tucked behind the curtain. Sirens began to wail past as the storm raged on. Thunder boomed, the rain came down in sheets and the lightning was relentless over the city. They teased me for being scared, they all thought it was awesome, but there was something unnerving about the sheer force of nature at play. We found out the next day the sirens were on their way to a house a few blocks down from us that had caught on fire in the storm – everyone was ok, there were no casualties, but I felt vindicated in my fear. The boys were just upset the TV had cut out so they would miss the football. I was getting tired and the storm showed no sign of stopping. 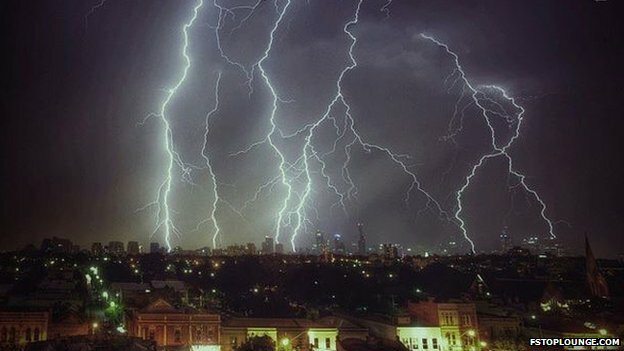 After chuckling at a few storm related tweets (my favourite being about the Cullen’s playing baseball in Melbourne – Twilight joke) I decided it was time to try and sleep. 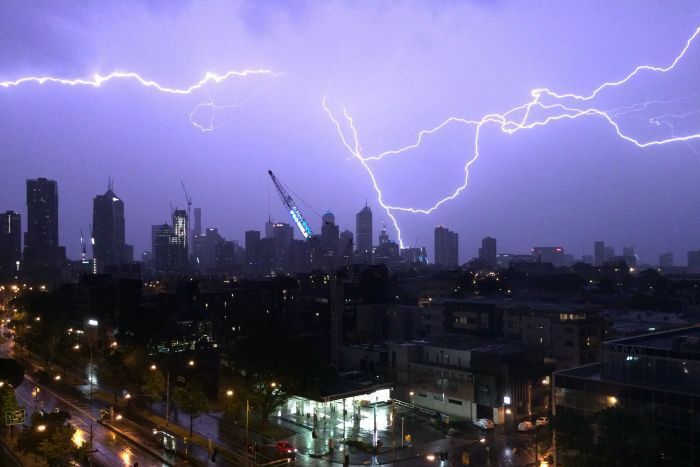 I was getting used to the constant boom of thunder, the rain was almost soothing and the lightning had begun to move round from us, continuing it’s destructive path along the city. I padded back to my room and crawled into bed, hiding myself in my pillows and drawing the sheets tights around my head. My tiny single bed shook as the thunder continued to roar, but eventually my eyes closed and finally I drifted off to sleep. When I woke up for work at 6am the storm was still limping along, the rain had begun to stop and the thunder sounded hoarse, like a giant who wasted his night screaming at the sky ’til his throat was raw and sore. The only sign of lightning were the scorched trees, broken phone lines and the tram delays. 3 months worth of rain in two hours, but the ground was nearly dry.